Subject:- Amendments in statutory rules of Sukanya Samriddhi Account Rules 2016 by Ministry of Finance (DEA) regarding. 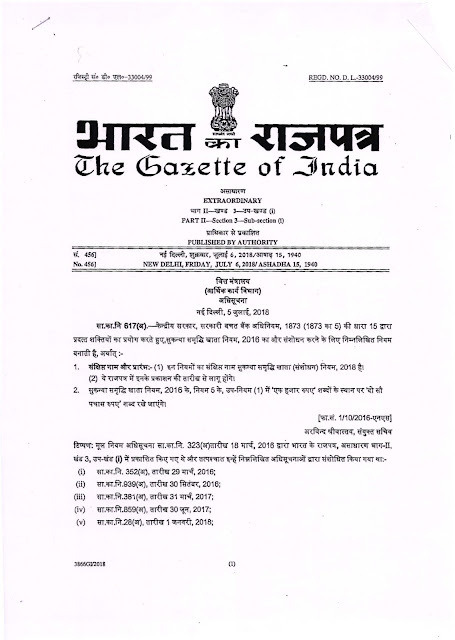 The undersigned is directed to enclose a copy of Gazette Notification No.456 dated 06 July 2018 regarding G.S.R.617 (E) dated 05 July' 2018 issued by MOF(DEA) for information and necessary action. 2. As per this notification, in the Sukanya Samriddhi Account Rules' 2016, in rule 5, in sub -rule (1), for the word “one thousand rupees" the following words- "two hundred and fifty rupees" shall be substituted. 3. lt is requested to circulate this SB Order along with copy of attached notifications to all concerned immediately. Necessary amendments to CBS and Sanchaya Post softwares will be made. 1. Short title and commencement:- (1) These rules may be called the Sukanya Samriddhi Account (Amendment) Rule 2018. 2. In the Sukanya Samriddhi Account Rules, 2016, in rule 5, in sub-rule (1), for the words "one thousand rupees" the following words "two hundred and fifty rupees" shall be substituted.